I'm home!! And man, oh man let me tell ya, it feels absolutely fantastic to finally be home!! I'm really, really, really hoping that I don't have to go back to Kelowna any time soon. If I do have to, I'm sure it will not be willingly and I'm pretty positive that I'll have to be dragged, kicking and screaming, all the way there. I don't want to get into the gory details of it all, but aside from the yarn shopping, our trip wasn't all that it was cracked up to be. It was pure crap. Not at all like previous trips to the Okanagan. Brett and I didn't get to do anything that we had wanted to do (well, I did make it to one yarn shop) and towards the end the weather decided to not cooperate, amongst other things. So needless to say I'm absolutely loving the fact that I am home. It felt sooo good to be able to plop down on my own bed, to eat whatever I want when I want, to move freely around the house without worrying that I'll overhear things that I shouldn't be hearing, to be able to breath without getting a headache from overuse of perfumes, to be in an alcohol-free house, to say whatever I want and not have to worry that someone will take it the wrong way and overreact in an alcohol-induced way...and most of all, to be free. Yes, there's a lot of chores that need to get done before life goes back to normal...laundry needs to get caught up on, groceries need to be bought, toys to unload and put away, luggage to stow, mail to sort, and emails to answer. 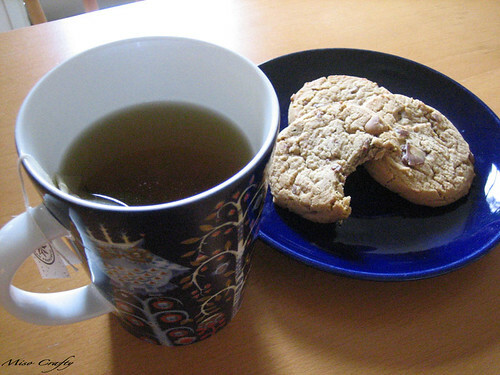 But first, I'm going to sit down and enjoy a cup of tea with a few cookies. Why? Because I can. Ahhh...there's no place like home!